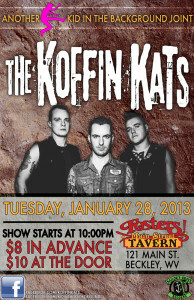 With over ten years of touring internationally and 1500+ shows, the Detroit based Koffin Kats new home is on the road. This trio kicked it off in June of 2003 with the mission to not stop for anything. Vic Victor (Lead Vocal, Upright Bass) would join forces with long time friend Tommy Koffin (Guitar) and start laying the ground work for the sonic assault known as The Koffin Kats. They put together songs with subjects ranging from Sci-Fi to dealing with the horrors of the real world. With Eric “E Ball” Walls (Drums) they began in small local bars playing for beer and eventually made their way out of the Mid West. The next couple of years proved to be up with numerous North American tours and down with drummer changes. During this time they released their first three albums – S/T (2003), Inhumane (2005), and Straying from the Pack (2006). These releases and the tours caught some attention and helped get the name of ”The Koffin Kats” noticed in the wide world of punk & psychobilly. In 2007 Vic and Tommy hooked back up with Eric to get ready for the fourth album, Drunk in the Daylight (2008), and began what the Kats are now known for… NON STOP TOURING & TRYING TO MAKE EVERY SHOW A PARTY. With their love for their fans and for the road they set out to play everywhere willing to listen to them. In the recent years they have been able to make a name for themselves in Europe as well and have been included on tours with some of the tops acts in psychobilly such as Mad Sin, Nekromantix, & The Meteors. In 2009 they released “Forever For Hire” and at the years end Tommy left the band to pursue a normal life. Shortly thereafter EZ Ian Jarrell took over the guitar and hopped on tour. While on the road they worked on material that would become featured on a split album with The 12 Step Rebels in released in Spring of 2011. 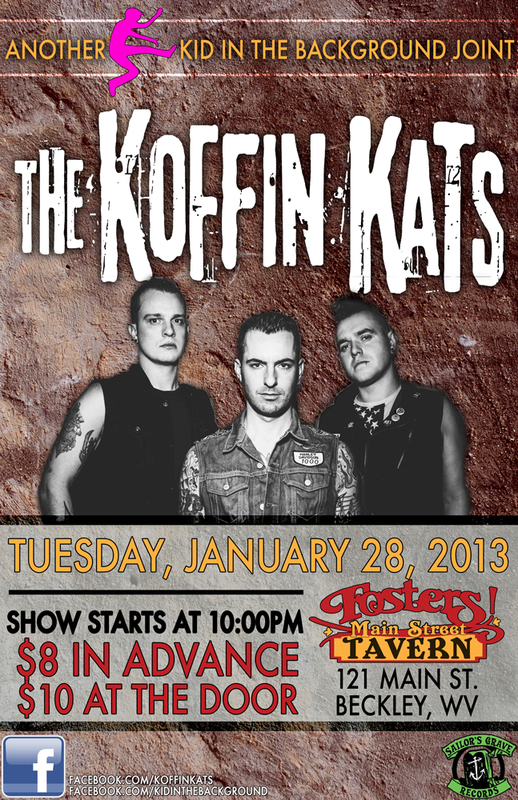 The Koffin Kats signed with Sailors Grave Records at the end of 2011 and released the length “Our Way & The Highway” in January 2012. Supporting that album with international touring all the way the through the summer of 2013. Now they are our supporting their most recent full length, “Born Of The Motor”, and will be on tour for the remainder of 2013 as well as a full year of international touring in 2014.